BRIAN BRITNIE AND ASHER: Ka'chow I'm 2! 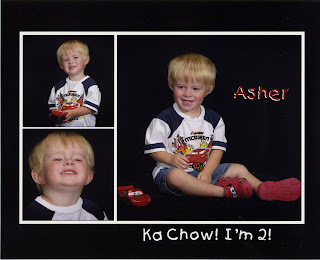 This is ashers 2 year old pic, i love when he tries to smile cause he has this fake little cheesy grin! As you might notice, Lightning Mcqueen is his idol lol! Love it! My boys are still obsessed with McQueen. Cute pictures! Hahahaha! Kachow! I love it B. His pics are so cute!! his picture is so dang cute!